The Voyager is my finest Electric Upright Bass model. Over 20 years of experience have gone into this design and the result is an instrument that I beleive is second to none. Engineered for the player who wants all the tone, response and feel of an acoustic without the unwieldy size and bulk. It features a full-length heel on the hand-carved Curly Maple neck with a select Ebony fingerboard and an adjustable, full size bridge. The tailpiece and endpin are also select ebony with gold-plated trim. The Barbera Multi-Transducer Bridge is mounted on an arched Curly Maple plate that responds to string vibration like a regular bass top. Two piezos per string assure that 100% of the Voyagers’ tone and nuance come through loud and clear. A padded upper bout replicates the back of an acoustic bass and the treble shoulder defines the upper body area. Both are removable and are custom made to each player’s specifications. The body is carved from select Black Walnut and adds a sleek, sculptural look to the bass. Tuners are by Hipshot, precise and dependable with a black satin finish. Standard strings are D’Addario HeliCore but other makes may be substituted. An onboard EMG preamp is optional or custom electronics can be installed in the conveniently located cavity. Comes complete with a fully-padded, nylon gig-bag and a heavy-duty flight case with wheels is available. For players who double at gigs on electric and upright, I can also supply a high-quality, fully adjustable stand. "This unit is the best transducer on the market. It reproduces both pizzicato and arco playing in a simply amazing fashion, with startling volume available and great sonic reproduction in all playing modes. It needs no improvement. My favorite bass will never part with the Barbera Transducer; it's the best by far for volume, balance, and true acoustic-bass sound enhancement. Basses come complete with heavy-duty padded gig bag and carry a full 1-year warranty. 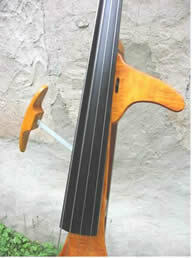 Check out the upright bass sound samples!